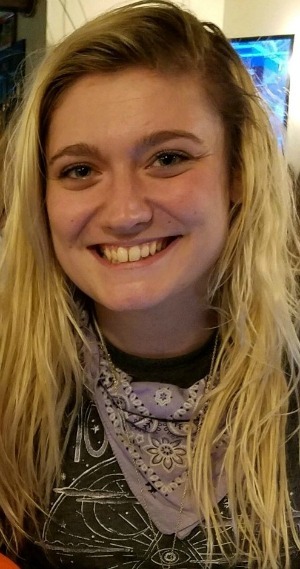 Morgan Louise Rineer, 23, of Lancaster, passed away on Friday, August 3rd, 2018. She was the beautiful daughter of Staci Quigley and Daryl Rineer (deceased). She was born in Lancaster on March 8th, 1995, and attended Manheim Township High School and Pennsylvania Cyber Charter School. She worked at the Red Robin on Lincoln Highway East, Lancaster, PA.
Morgan was a beautiful, bright, loving soul that touched so many people. She loved riding her moped, spending time with her family and friends, and making people laugh with her infectious smile and vivacious personality. Some of the best moments in her life were spent on the beaches of Tybee Island watching the sunsets. She will forever be remembered as our angel “Sweet Pea” and will be missed by everyone who knew her. She is survived by her maternal grandparents; Douglas and Donna Quigley, paternal grandparents; Earl and June Rineer, and Sandy Dickel, a sister; Mya Vogelsong who meant the world to her, aunts; Traci Eshleman, Donna Pomerici wife of Michael, an uncle; Duane Rineer husband of Kim, cousins; Josh Rebman and his two children Tessa and Paxton Rebman, Brandon Foltz, Mikahla Pomarici, Mikey Pomarici, Griffin Rineer, Hallie Rineer, Averie Rineer, Michael Dombach, Christina Dombach, Sebastian Hoyt, and Colton Mannino, Jessica Shalter wife of Chris, great- uncle; Donald DeBord husband of Kathy, and great-great-uncle; Gilbert Fry. She is preceded in death by her father, an aunt; Denise Dombach wife of Jeff, and a cousin; Martin Dombach. The family has planned and respectfully invites you to attend the Memorial Service at the Millersville Mennonite Cemetery, 435 Manor Avenue, Millersville, PA 17551 on Friday August 17th at 11:00AM. The staff at DeBord Snyder Funeral Home & Crematory, 141 E. Orange St. Lancaster, PA 17602 are handling the arrangements. I am so sorry for your family’s lose. I pray for comfort and peace for your family!! My thoughts are with the Rineer family and Staci. I am so truly sorry that you must go through this. I feel blessed to have known Morgan, her smile and her tears. May you find peace in knowing how much joy she spread to everyone who knew her. I never really knew her in school but she was well liked by everyone that she came across! She was always smiling and making people laugh! She was a beautiful woman and now she is a beautiful angel! She definitely will be missed! RIP gorgeous! My prayers are with her family and close friends! Staci and Traci, Keeping Morgan and the entire family in my thoughts and prayers. Heaven has gained a beautiful Angel, and I can only imagine Morgan’s joy when she reunited with her dad. May all your wonderful memories give comfort, God Bless. She will be missed and i am glad i got to see her one last time. I will continue to pray and send happy thoughts and love to Morgan. I used to do midget cheerleading for Township with Morgan in middle school. She was always so funny but one of the hardest working girls on the team. Thinking of her family during this time. Im so sorry for your loss..Staci..my thoughts and prayers go out to you ans your family.. I remember the first time I met you. I knew, in that moment, what drew my son to you. Your smile was so bright. You could almost feel the buzz of creative energy in the air that filled your personality. Occasionally, through the cracks, one could catch a glimpse of the weight of the world hidden behind that beautiful smile. This world is not as bright as it once was with you in it. You left a mark on my son’s life, thus mine. Rest easy beautiful girl. Such a sweet girl that did indeed touch the hearts of so many. Condolences to Morgan’s wonderfully loving family. Such a sad ending to a beautiful, happy soul. Prayers to you, Staci, and all of those touched by your angel. Many prayers and lots of love being sent your way. My hearts goes out to all of the Rineer family . Morgan will be missed tremendiously missed. My thoughts & prayers are with you Staci, Mya, Doug, Donna & all the rest of her family. Morgan was a beautiful girl inside & out. She will be missed by everyone. So very sorry for that’s huge loss. I can’t imagine the pain. This beautiful girl has left this world much too soon. But I firmly believe that she continues to exist in some quantum force field, made of energy and light and we will meet with our departed loved ones again. Morgan was such a sweetheart. She visited my son, Henry, often in our apartment, most often with their gaggle of friends. Her smile lit up the room and the love she spread made everybody happy. Sending love and prayers to all of Morgan’s family and friends. My deepest condolences to Morgans family. Cant even imagine how you all feel. God received a beautiful angel!!! My Deepest Condolences to all your family. A wonderful woman , will be deeply missed . Morgan your spirit will live on in all of us. You know I’m here and will be for you and your Mom and Dad. We go back so far, she’s standing with her Daddy always and forever watching over you. Love you hon. So sorry for your family’s loss! My son went to school with her and she spent time at our home bring cheer to everyone. Always laughing and so caring taking time to listen to a 15 year old nephew problems and making him smile. Thinking of you and your family at this time of horrific loss. Praying for peace understanding and comfort. May she be resting peacefully. Love and sympathy. I am so extremely sorry for your family loss. Morgan and my granddaughter, Madison Hayes were good friends, and Morgan spent a lot if time at my home with Maddie. I am so glad I saw Morgan a few months ago and she looked so good. Maddie is having a real hard time and I am trying so hard to help her. I pray for you all every day that he gives you strength and courage. God bless all of you. Im so very sorry. Morgan was a great friend to me and I will miss her terribly. Our heartfelt sympathy to your family. your precious granddaughter to rest. Amber and I met you many years ago back on Spruce Street with Shayla and Nikki (May God rest her soul as well!!!). It was about the time we were talking to Nikki about getting clean! Morgan was a very important part of that! Amber and I only remember her ever either laughing or smiling or joking always! She did, she lit up any room she walked into! This thing is taking way too many good kids too young! Our heart goes out to her family and we can continue to pray for staci and family! You know, sometimes there is absolutely nothing you can say! Staci, if you want to get a hold of either Amber or me please contact me at 717-621-1807! Remember, we told you that we would always be there for you at any time….. Day or night!